Low cost carrier Wizz Air will expand its operations in Serbia this coming summer season by increasing frequencies and capacity on existing flights, while launching one new route and resuming a previously suspended service. From its base in Belgrade, the airline will grow frequencies on flights to Dortmund, Malta and London Luton, which will be maintained five times per week and the latter two four times per week. Furthermore, the airline has upped capacity to the British capital on select days from the 180-seat Airbus A320 aircraft to the 230-seat A321 throughout April. 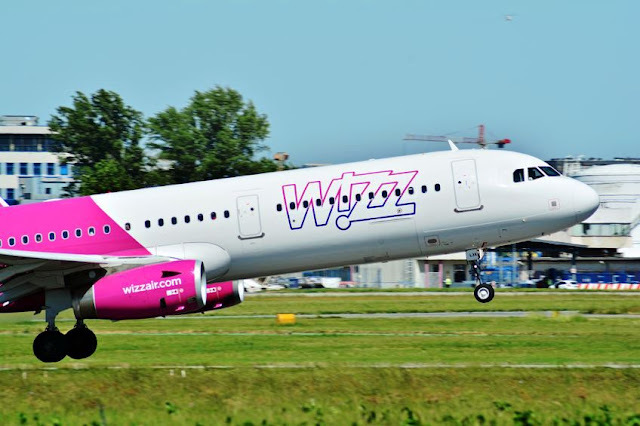 Wizz will also introduce a new two weekly service from Belgrade to Lyon. Initially scheduled as seasonal, the route has now been upgraded to year round. Both airports are run by operator VINCI. "With the new route, we will now serve fourteen destinations from Belgrade to seven countries. As a result, Wizz Air will support close to 700 jobs in Serbia this year alone", the company said. Wizz Air will resume flights between Malmo and Niš this April after discontinuing the service on January 7. Flights between the two cities will restart on April 17 and will run twice per week, each Wednesday and Sunday. The route was shelved following the closure of the budget carrier's base in Poznan, from where the operating aircraft was deployed for the Malmo - Niš service. The jet will now be sourced from the airline's Katowice base. In total, Wizz Air will have 921.000 seats on sale from Serbia this year. The airline handled close to 800.000 travellers on flights to and from Belgrade and Niš in 2018, representing an increase of 6% on the previous year. Wizz Air's CEO, Joszef Varadi, recently said, "We are totally committed to the [Serbian] market and we hope to see some improvements of commercial terms in the marketplace. That would certainly attract us with more capacity. We will see what VINCI will bring into the party". The airport operator previously noted it would keep Belgrade's fees unchanged for the first three years of its 25-year concession. However, VINCI can make changes to the airport's incentive plan. Wizz Air's last major expansion in the Serbian market came in 2017 when it based its second aircraft in Belgrade and introduced a number of new routes. Finally they woke up a bit. I'm hoping they finally base a third plane in BEG in 2020. They are getting a lot of NEOs from Airbus so I would think that is very possible to happen. Interesting to see Malta performing well for them from both BEG and SKP. BEG-MLA will be daily in summer. Yes, if you count Air Serbia's flights. I brought in January two return tickets from BEG to MLA for flights on April 26th and return on April 29th for 130EUR per person. Now tickets are 340EUR for the same dates more than month before the flight. But for the dates before April 26th tickets are still around 130EUR for the return flight. This show that Malta is very popular destination during holidays and during summer season but for the rest of the year on this route majority of passengers are Serbians living in Malta. Let us know how the loads were on your flight. Meh... nothing major really. In conclusion they are adding 6 new weekly frequencies from Belgrade. As for the A321 from Luton, why do I have a feeling it has more to do with technical reasons than actual demand? If it was due to demand than A321 would stay for longer. I would say the A321 is rather there because of Easter. Considering how passive they have been on the Serbian market this is a good start. A321 ops from London will eventually be extended on two out of four weekly flights for the entire summer. New route is a cosmetic change for you? Lyon is likely to be upgraded to year round. Doubt it, I think it will stay seasonal as there isn't so much demand in winter. GVA is the primary market. I agree with anon 09:15. As I see tickets for LYS are available for the next winter season, until March 28 2020. So it will probably be year round route. @9.07 Lyon is year round. Tickets are on sale for winter. @9.15, 9.17 both of you are wrong. LYS stays 2x weekly in winter. That wasn't the case a few days ago. I guess advance bookings were extremely strong. easyJet from GVA and Wizz Air from LYS don't operate on the same day so there is absolute flexibility for the passengers. Two airports are just 149 km away. "Low cost carrier Wizz Air will introduce new seasonal flights from Belgrade to Lyon this coming summer"
@Admin, what is the correct information? Seasonal or not? As you may notice in the article above, the route has just been upgraded to year-round operations. They have also rescheduled a whole bunch of flights. Does that mean that the crew on the Malmo-Nis flight is Polish? Yes just like BSL-OSI is operated by Serbian crew. I looked at their schedule and it seems MMX will have another rotation to somewhere before the flight goes back to Belgrade. Wouldn't it be more logical for BEG plane to operate BEG-MMX-INI-MMX-BEG with Serbian crew? Probably would be too long day for one crew. It wouldn’t be too long, as flights would be around 2:00 hours approximately, it would fit within the flight time limitations for the crew. It is not about length, but about number of aircrafts. KTW is base with 6-7 aircrafts comparing to BEG's 2. They do not have capacity for this from BEG base unless they base one more aircraft. Waiting for Belgrade-Vienna with W6 please! Why? Do you think they would not be able to compete against Austrian and Air Serbia? OS-JU operate a total of 34 weekly flights with fantastic schedules. Wizz Air will have to have a lot of flights in order to remain competitive against those two. I don't think they could succeed with less than 4 weekly flights, split schedule, morning-evening. They might have 34 flight but they are also very expensive for a flight lasting just over an hour. Absolutely, they are. However since pricing was brought back to Belgrade, fares for same day return flights have gone considerably down. In the past JU was €420 while now it's around €200. Same for OS... you can find one-way tickets for €100 which is great compared to what we had in the past. OS was €600 before. So I would say we are moving in the right direction. It could also be a preemptive strike against its competitors. Wizz may fly in the middle of the night and will still have full A321 on Belgrade-Vienna route. Even with all the competition I still think Wizz could make it work to Vienna as the number 1 gasto destination. Isn't Zurich the number 1 gasto route? Actually I think Bratislava would be a smarter choice. There is a growing Serbian diaspora in Slovakia and this way they would not compete directly against Austrian and Air Serbia. But again, there is already Nis-Bratislava with Ryanair. But again, what`s that got to do with anything? We will see how long Ryan survives on Nis-Bratislava route against Wizz's Nis-Vienna. I was expecting that at least few new routes from Nis would be announced, since there is Paris, Oslo, Frankfurt, Amsterdam, Rome and many more potential destinations unserved. I do not know what are waiting for.. I think that despite optimism by some it has been proven that Nis is a very small and extremely seasonal market which is why FR and W6 have cancelled routes. Or simply INI expanded way too fast in the beginning. We need to give time for these routes to mature before new ones are added. They did manage to keep LX despite the airline's utter failure in all of ex-YU besides BEG. W6 flies from FRA only to 3 airports in Europe (Kiev, Sofia and Budapest) and there is no chance to start even BEG. They might be waiting for the subsidy tender in INI for new routes. What would be the point of launching new flights if they could get money for them in a few months. I hope they will actually be considered and that the tender won't be fixed. It seems that a London-based aircraft is taking over the Luton route and that it won't be operated by one of the two planes in BEG. But there is already a direct GVA flight on easyJet. So many flights to France all of the sudden. VINCI effect? New flights to Lyon by Wizz, Nice by Air Serbia, Paris by Air France and ASL France, extra frequency to Paris by Air Serbia. In total 14 extra flights from Belgrade to France this summer. I think France was generally underserved in the past so airlines are rushing to fill the void. It just shows how badly they were needed. I really hope ASL survives because tickets between Belgrade and Paris are crazy expensive and Wizz Air with its Beauvais flights is not a real alternative. And even Wizz is very expensive on this route by its standards. BEG to that village BVA are almost always north of €300! Good luck Wizz. Hope they add more destinations in the future. That's true Wizz Air over takes the most. They actually said they would. Can Lyon be considered a gasto route or not? sure, it is the competition for Easyjet GVA route. Like someone said, Lyon and Geneva are 150km apart. I would hardly say they compete against each other. Yes it's a gasto route. Many Serbs live in Lyon. Is this the first time Wizz is operating some route with A321 to Belgrade? Yes, there were a few diversions in the past but those don't count. Wizz Air should have launched BEG-LIS this summer. It's probably the biggest market left unserved from BEG. That said, Berlin and Barcelona were their biggest missed chances. Something tells me TAP will relaunch LIS-BEG. Wizz's biggest missed opportunity rom BEG is certainly the Iberian peninsula. Somehow I have always had doubt about BEG-LIS. TAP started this route and it didn't last long. I know that flying times were terrible and that there were a lot of delays. Also TAP was struggling at that moment, but honestly I do not see the demand here. There is no diaspora, economic ties almost zero, connecting flights already offered through many other bigger airports and the flights take way too long that could not be very attractive price wise. Only tourism (and probably one way tourism from Serbia to Portugal) could bring some passengers , but in that case charters are more than enough. Maybe I am wrong and I wish I were wrong, but that is how all situation looks to me. TP had great loads btw. They experienced fleet shortage and their operations kept on crashing. Delays of several hours were not uncommon back then. I think two weekly from June to September could work on an airline with low operating costs such as Wizz Air. The sweet-spot on that route for TAP, for passengers from BEG, is also onwards connections to South America. This should not be overlooked. London was never a popular neither for Belgrade nor Zagreb, which is quite strange, tbh. Yes, Serbians need visas for UK and so do Ukranians but still much more flights for example from Kiev. W6 should have minimum daily or 10 weekly flights to London. Not to mention the strange absence of ZAG-LTN! W6 are seriously being extremely passive in BEG. A huge, European capital bigger than PRG and SOF needs minimum 5 W6 planes and more connections to UK, Spain, Ukraine, Portugal, Israel and Czechia. As an EU registered airline they cannot fly from Serbia to Ukraine or Israel. In other words any non EU destination. Exceptions are Switzerland, Norway, Iceland and soon UK. Why is it so difficult to understand that EU LCC can't fly any route between countries that are not in EU based on Open sky agreement if they do not obtain special permissions? LJU has incredible connections with London, so ZAG really doesn´t need them apart from British Airways that fly to LHR. On what earth BEG is bigger city then SOF and PRG? Have you been to both cities? In terms of population. Belgrade is much bigger than both cities. You must be kidding. Sofia is comparable to Belgrade, on the other hand Prague is almost two times Belgrade. Anon 1740 is right. PRG is the biggest of the 3 based on population. BEG and SOF metro almost 1.7m though BEG is very slightly bigger. Real metro area of Belgrade have 2.5 million people, which include Pancevo, Smederevo, Nova Pazova, Indjija ETC. BEG metro area you mentioned is city limit, but you don't know that different towns are just 10 km of Belgrade and not part of city proper. Real metro area include towns OUT of city proper. They don't care because like this they get to belittle Belgrade and that's all they care for. 800,000 is not a bad result for last year. With another aircraft (either in BEG or INI) they would have around a million passengers. Nice to see LYS upgraded. Hope they turn LCA to year round again. If the flights from SKP prove successful this Summer I can definitely see them increasing capacity and extending the flights to Autumn. I don't see them going year round unless JU abandons it first. JU isn't suspending their flights in winter, they even increased it much earlier this year so I guess they are doing fine in LCA. I don't think Wizz will bring back their own flights in winter, they are happy with summer flights. I think they sold most of their seats to tour operators. All these are one-way and do not include luggage. JU on the other hand is 17.000 one way or 25.700 return. Those fares are crazy but I'm not surprised. I'm flying to Larnaca during the first week of April. Air Serbia was the cheaper option. I booked 2 weeks ago. Great to see Wizz expanding from Belgrade again. Hopefully this is just a warm up for next year. what other routes are really left for them to add from BEG? They could return to Norway and Belgium. CRL is really needed so that JU ends its evil monopoly on the route. Fares are extremely affordable from SKP. Evil monopoly? Are you talking about Wizz at Tuzla again? It is interesting how come nobody's noticed that Wizz has reduced VIE-INI from three to two weelky and increased BEG-DTM from four to five weekly. I can't blame VIE-INI. Just check the fares they are currently offering. My guess is that there is a fierce competition again with FR on the INI-BTS route. There are many seats for dirty cheap prices. It was also a crazy idea to deploy the A321 on the INI-VIE route. Wizz from Belgrade should try Palermo, Catania and Malaga twice a week . I think there's other more priority routes needed for BEG asap, like Lisbon and Dublin. For Dublin Serbs need visas, it is not worth the hussle. Lisbon ony works with connections, and only TAP could provide them as it is.